London definitely has no shortage of musicians, and sometimes it is difficult to stand out from a crowd of ever-changing interests. Dahlia Sleep’s seem to be doing just fine, by consistently having new songs for their fans to listen to. Just seven months after the release of their first EP, they are back with ‘Love, Lost’, which is a mix of electronic-pop and atmospheric indie. 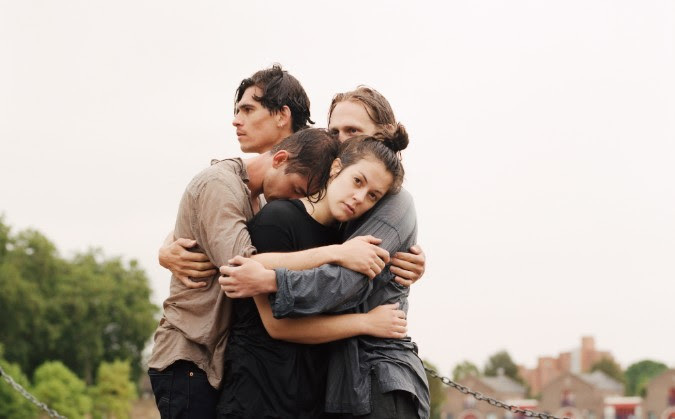 Speaking of the new EP, which was recorded in a tiny basement studio in London, vocalist Lucy Hill says “it is all about seeking truth and honesty and putting it on record – whether that be grief, anger, love; often things that have been left dormant and unresolved.” The opening single, ‘Storm’ is a simplistic synth-bath telling a tale that seems to be about being somebody’s backbone when they’re going through something negative - “don’t be defeated: fall into the deep with me” whereas ‘Settle Down’ is more upbeat, though still lyrically on the sadder side of things. “I hurt those I love, the most.” It is something that Daughter have made a great musical career out of. There’s nothing better than being able to dance around to an upbeat song, whilst screaming the emotional lyrics at the top of your lungs. ‘interlude (loving you still)’ is a piano ballad drenched in that intensely mournful London Grammar style that we cannot help ourselves from listening to, even though we know it will probably make us cry at some point. “It brings me to my knees, cause you’ve found peace, but I’m still here.” It almost feels as though you can hear the tears choking up Lucy’s throat – there is a real sense of honest and raw emotion that she is able to capture. ‘Love, Lost’ feels like reflection and an outside perspective on heartbreak, journeying the search for freedom from the negativity. It is in a similar vein to the interlude but it is melodically, more upbeat. In what feels like a shift, to bring the story to a happy ending, ‘To The Water’ is full of elements of Mt. Wolf and Broods’ style of ambient electronic-pop. As the song progresses, the more bass notes follow which adds an intensity to the mood of the track, but never dampens it. The added thought of having an intro, interlude and outro really helps to annunciate the dialogue that Dahlia Sleep are creating. The EP is not just a body of work, but a story that is intended to be listened to, from start to finish.